After decades of deregulation, this time the corporations are launching a direct assault on the very principles of environmental regulation, public services, labour rights, civil liberties, environmental and banking regulation (of course), and even basic safety standards for the food we eat. As if that’s not enough, it will also give multinational corporations the power to sue democratically elected governments for implementing any policy that threatens their profit margins – even if those are the polices we voted for. It’s no exaggeration to say that almost every legislative victory won by progressive forces since the Second World War has cause for concern over TTIP. 2. A threat to jobs & labour rights – while Cameron promises TTIP will create jobs, its Western equivalent, the North American Free Trade Agreement (NAFTA) between the US, Canada and Mexico contributed to rising poverty and unemployment across the board, costing an estimated 1 million American jobs. The European Commission itself admits TTIP will encourage corporations to go to the US and wherever labour is cheapest and unions weakest, galvanising a global race to the bottom, pushing wages down even further and causing ‘prolonged and substantial’ dislocation for European workers. 3. The end of public services – worsening the threat of poverty and unemployment is the destruction of social safety nets, as the red carpet is rolled out for US companies to bid for healthcare contracts threatening to ‘destroy the NHS’ according to some MPs. Leaked documents have exposed the lack of any safeguards to defend such basic services. TTIP threatens to stand the whole anti-cuts movement on quicksand, pitting the movement to reverse privatisation against international law itself. The corporate onslaught against Slovakia‘s relatively leftist government since 2006 foreshadow what’s to come – already one foreign private healthcare company has seized €29.5 million in public assets for their attempt to limit private profiteering in healthcare, and another is trying to block the Slovak government from providing universal healthcare cover. 4. Civil liberties – remember the Anti-Counterfeiting Trade Agreement, rejected by the European Parliament following massive public opposition? Thanks to Wikileaks, we know that TTIP threatens to slip in key elements of it under the table, undermining data privacy laws and forcing internet service providers to monitor copyright infringement and threatening exemptions for schools, libraries and the disabled. More draconian restrictions on intellectual property can restrict access to essential goods, from food crops to medicines, for millions around the world. 5. Destroying the planet – threatens environmental regulations of all kinds, and is expected to add an extra 11 million metric tons of CO2 emissions, undermining the incremental steps the EU took under the Kyoto Protocol. Leaks have also revealed TTIP also opens the flood gates for mass exportation of oil from the Canadian tar sads, as well as shale gas from fracking in the USA, effectively putting a ball and chain on environmental and community campaigns in both countries while normalising these damaging and dangerous practices here in the UK. Of course the government is quick to point out that the degradation of our ecosystem and basic conditions for life on this planet is acceptable because we’ll end up with lower gas prices – assuming energy companies pass their savings onto consumers (which they don’t tend to do). Sure, maybe some of us can shop around – but as Jeremy Hardy says, it ends up like match.com: you evaluate an endless stream of pretty unappealing options until you get so tired you end up getting screwed by one of them. 6. Poisoning your food – TTIP will also set us on the road to American supermarket isles, where genetically modified foods and meat treated with hormones and growth promoters will not only be on the shelf, but might not even be labelled as such. Environmental impacts and animal welfare will also likely slide off the bottom of the agenda. Research has shown these products can pose grave threats to human health, animal welfare and the natural environment. Public opposition and safety concerns were at the heart of making them illegal under EU law. 7. Stealing from the South – if it passes, the introduction of TTIP will re-double pressure on developing countries to adopt the same (lack of) standards and really put the ‘shock’ back in the shock doctrine. It will marginalise developing economies like India, China and Brazil while robbing poor countries of what little sovereignty they have left over their economies. For much of the global population it will lead to worsening poverty, dispossession and instability. 8. Destroying our democracy – TTIP will legalise ‘investor-state disputes‘ allowing companies to sue governments at taxpayers’ expense in corporate courts whenever their policies undermine corporate profits – anything from re-nationalising key industries and public services (like the NHS) to preserving existing regulations on wages, corporation tax and environmental protection. Trying to articulate alternatives in the face of a suffocating political consensus on cuts and neoliberalism is hard enough, without it being enshrined in international law. Thanks to NAFTA, Canada has been sued $250 million by a US energy company for respecting Quebec’s referendum against fracking. 9. America – you have to hand it to the USA: it’s a brave new world over there. Despite being the world’s richest economy and strongest superpower, it’s the most unequal country in the developed world. TTIP is about letting the corporations that profit from that mess run rampant throughout the world, and dragging our regulatory standards down to their level. It leads the West in levels of incarceration, mental health problems and violent crime. It’s also managed to maintain some of the poorest health standards in the developed world alongside the most expensive and least effective healthcare system. As any progressive American can tell you – we don’t want to go there. But that’s where we’re headed. 10. The race is on – TTIP was not supposed to enter the public domain, but documents have been leaked by Green MEPs, Wikileaks and others. Now it’s been exposed, people across the world are taking action. One of the downsides of trade deal that will impact so many different sections of society for so many different reasons is that it creates a lot of common ground for progressive campaigns. As a threat to social justice, civil liberties and the environment, TTIP should be seen as a natural unifier, as illustrated by the broad range of organisations pledging support – from the People’s Assembly and War on Want to STOPAIDS and the Jubilee Debt Campaign. It comes at a time when building broad-based opposition to the neoliberal agenda has never been more urgent. 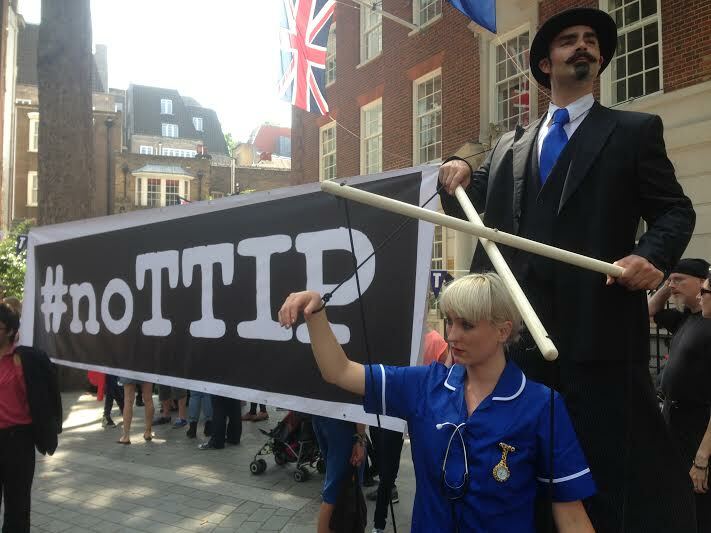 If TTIP passes, it will strike at the heart of everything the left is fighting for. A trans-Atlantic threat calls for trans-Atlantic resistance, as it looks increasingly like all these campaigns will be won, or lost, together.